Inlanta Mortgage Partners - August 2012 - Inlanta Mortgage, Inc.
We are pleased to announce the promotion of Robin Hughes to Funding Manager and the addition of eight new employees to our corporate staff. Robin Hughes joined Inlanta in October 2011 as a compliance and quality control analyst. At this year’s 8th Annual Sales Conference, Chief Operations Officer Jean Badciong announced Hughes’ promotion to Funding Manager. Before joining the Inlanta team, Hughes was the Vice President of Operations at GSF Mortgage. Hughes has been in the mortgage industry for 23 years and her career has included positions in underwriting, closing operations and compliance. 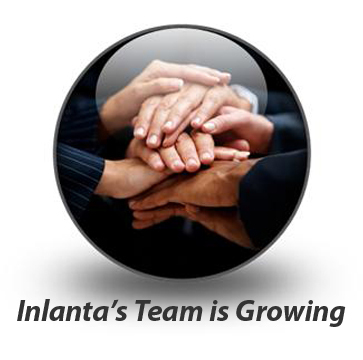 Inlanta has also filled new positions in underwriting, funding, closing, processing and shipping. Inlanta’s new hires to the underwriting department include Junior Underwriter Erin Singer and Underwriter Ginny Holler. New additions to the funding department include Secondary Marketing Assistant Trevor Johnson, Shipper Jill Golla, and Closer Jon Donovan. The central processing department added Rosemary Anderson as a junior processor; while the administrative department added Receptionist Judy Kinart, and Human Resources Assistant Rosemary McCullough. Inlanta Mortgage offers Fannie Mae/Freddie Mac agency products, as well as a full suite of jumbo and portfolio programs. The company is fully delegated HUD-FHA including FHA 203K, VA, and USDA approved. Inlanta Mortgage also offers numerous state bond agency programs. Review Inlanta’s mortgage loan programs on our retail website here. Inlanta Mortgage employees helped raise $4,000 for local charity. Pictured from left to right: HFH Board President Betsy Ellis, HFH Executive Director Rick Congdon, Inlanta President Nicholas DelTorto, Inlanta CFO John Watry. Inlanta Mortgage held its eighth annual sales conference Monday August 13th and Tuesday August 14th at the Harley Davidson Museum in Milwaukee, with over 100 employees in attendance. This two day meeting brought both branch and corporate employees together to discuss and share best practices, department updates and corporate initiatives. The conference also hosted guest speaker Tammy Maddente, Vice President of First Weber Group, who gave a presentation on current real estate trends and changes and provided valuable insight into the industry directly from a Realtor perspective. The second day featured international speaker Matthew Ferrara who presented two sessions focusing on selling to the next generation of consumers and developing great growth strategies. During the conference, Inlanta raffled off prizes donated by sponsors, with all proceeds benefiting Habitat for Humanity of Waukesha County. Altogether, Inlanta employees donated over $2800. Inlanta Mortgage also contributed to the organization for a combined donation totaling $4000. The money will go towards Habitat for Humanity of Waukesha County’s largest fundraising event, a wine tasting and silent auction on October 14th. Inlanta Mortgage provides its partner branches with outstanding support services including marketing, compliance, processing, human resources, training, technology, accounting, legal, as well as in-house funding and underwriting.